Probably my favorite way to make some extra cash is by playing apps on my phone that pay me real money, but recently I’ve been really enjoying thrift store flipping as well. 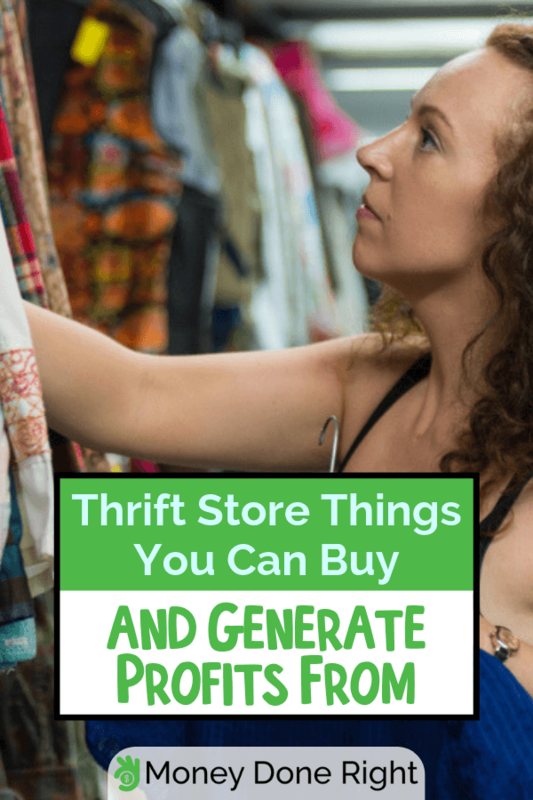 If you have a talent for finding great deals at thrift stores and consignment shops, you can easily make a lot of money by selling those items for profit. The wonderful world of thrift store flipping allows quite a few people to supplement (or even replace) their fulltime income simply by finding the best things to buy and sell for profit. One of the most valuable items in the world of thrift store flipping is upholstered furniture – such as a chair, sofa or table. It is very important to keep an eye out for high-quality, well-built furniture. Unfortunately, these quality furnishings may be covered in ugly fabric at first sight. However, if you can reupholster it, you can successfully turn a visual eyesore into a money magnet. Click here to sign for Chairish – a mobile application that lets you sell and buy used furniture! It may surprise you that college textbooks generate big profits in thrift store flipping – especially if they are still being used in schools today. Most thrift stores will offer drastic discounts just to liquidate these books, which means you can make a huge profit by investing in the best ones. You can use websites like AbeBooks.com to help calculate the resale value of textbooks that you may come across during your search. In addition to college textbooks, keep an eye out for first-edition novels and classic storybooks. Even with the rising popularity and prevalence of eBooks, there is still a major market for consumers searching for traditional paperback and hardback books. You should focus on classic box sets and trilogies – such as The Lord of the Rings, Anne of Green Gables, and Little House on the Prairie. Old camera equipment and accessories are some of the easiest things to flip for profit as well. SLR cameras and lenses may seem outdated – especially with the vast number of DSLR cameras on the market today. However, there is still a profitable market for old cameras and lenses in thrift store flipping that can make you a substantial profit on the back-end. Click here to get a quote for your old camera equipment from BuyBackWorld.com! Classic turntables and record players are still big hits for nostalgic consumers interested in the quality sound created by this type of equipment. Make sure that you test any record player before purchase. You must make sure it is functional to help maximize its resale value as you search for the best things to buy and sell for profit. Cassette tapes may seem outdated. Within the average department store, you will more than likely not be able to find any for sale. As a result, nostalgic consumers who enjoy living in the past when it comes to this vintage technology will frequently search high and low to find quality cassette tapes from popular artists. If you can get your hands on some, you will more than likely be able to turn your minor expense into a major profit depending on the value of your findings. Since record players are some of the best items to flip for thrift store flipping enthusiasts, it makes sense that classic records and even record sleeves would also generate a big profit. It is important to focus on the popularity of the artist along with the rarity of the record when selecting which ones to purchase. Old computers cannot compete with new computers when it comes to speed, performance and capability. However, when it comes to nostalgic consumers and collectors, you can make a lot of money with the perfect old computer in your inventory. Make sure that you test functionality before buying any of it. The last thing you want is to pay top-dollar for junk and scrap metal. Think of your favorite classic board games – such as Clue and Monopoly. If you find any of the original versions of these games, you can flip them for a major profit. Stay away from the newer remakes and revamped editions, because you will be disappointed by resale value. Think about the drastic ways in which toys have changed over the years. They are nowhere near as sturdy, durable and long-lasting as they were once upon a time. Remember to pay close attention to the appearance and condition of these toys before buying them. You may need to spend a little time cleaning or even repairing them to maximize their resale value and your profit. LEGO is a brand that has truly survived the test of time successfully. However, even this brand’s collections have changed in structure and design over the years. If you manage to find a vintage set of old-fashioned Lego pieces and sets, you can generate a nice-size d profit with strategic thrift store flipping. A growing number of people upgrade their smartphones and mobile devices each year.Instead of allowing their old phones to collect dust or sit in drawers, there is a thriving market for selling these devices online. You can use websites like Decluttr to cash in and sell used smartphones to them with free shipping. Click here to sign up for a Decluttr account, generate a quote and find out how to ship your boxes for free! You can make a nice profit by flipping antique chocolate molds, too. You just need to pay close attention to the age of the mold. Follow the basic rule that “older is better” and you may stumble across a few goldmines in this market without even realizing it. Make sure that you do not skip over the photo frame section of the thrift store. You might think to yourself, “The last thing that anyone wants is another frame!” However, this assumption misses the mark completely. Store-bought frames available in most department stores and dollar stores are quickly overlooked in most thrift stores. Nevertheless, vintage frames are viewed by antique-lovers as prized possessions. Search through the frame collection to look for the frames that look like they were unappreciated family heirlooms passed down through the family tree. With a little tender love and cleaning, you can easily breathe new life into old music instruments. 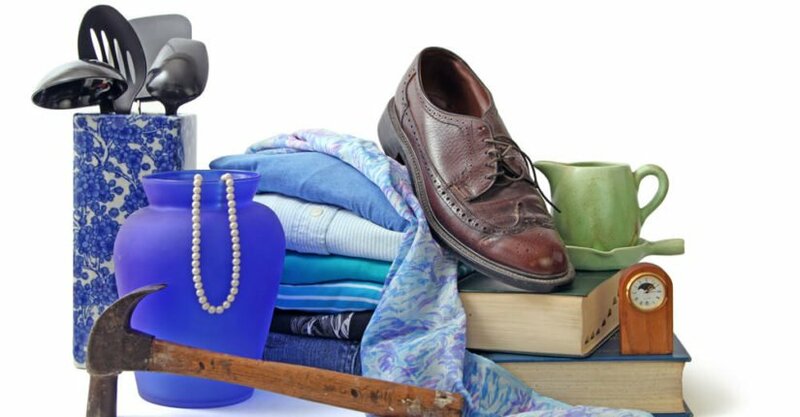 Thrift stores and consignment shops may try to liquidate these items from their inventory – which means you can buy them for cheap. By investing a little time and effort into repair & maintenance, you can easily sell used instruments for maximum profit. You may remember owning a classic globe years ago when they were featured in most homes, libraries and school classrooms. They seemed to fade in prevalence over the years – especially when the Internet and GPS became primary navigational tools. This means they are now some of the best things to buy and sell for profit. Keep in mind you may have to spend a considerable amount of money to ship these globes to online customers. However, the profit may far outweigh the associated expenses. You may not see a lot of Pyrex dishes and cookware in your search for thrift store flipping items. There is a good reason for that: supply and demand. Vintage Pyrex cookware items still generate a good buzz among antique lovers and fans of other vintage products. . Check to make sure that the items are in good condition before you make any purchases. Any sign of wear & tear or cosmetic damage can have a negative effect on its resale potential. Kitchenware and cooking equipment have drastically changed in recent decades. However, there are still cooks, consumers and collectors that are willing to pay top dollar for vintage kitchenware and cooking tools. Examples include such tools as meat grinders, meat tenderizers and butcher equipment. Be careful with the shipping and handling of this equipment whenever you want to flip it for profit. Think about how popular coffee mugs are today – especially the mugs with beautiful artwork, catchy sayings and even famous faces on them. You can make a considerable profit through thrift store flipping by keeping an eye out for old coffee mugs that are in good condition. With a little “elbow grease” and thorough cleaning, you should be able to get them looking good and worth a pretty penny. In recent years, the rising concern and awareness of BPA has caused consumers to search for antique vs modern mason jars. Therefore, you can make a substantial profit with thrift store flipping if you happen to run across any of them. In addition to antique mason jars, you should also keep an eye out for cobalt blue bottles with an antique appearance. There is an interesting niche market for this type of glassware that helps to keep thrift store flippers in business mainly because of the people who overlook them. Check the condition and appearance. Make sure that you preserve both of those factors when you prepare it for shipping and handling. With proper care and cleaning, you can easily make a substantial amount of money by flipping antique mason jars and cobalt blue bottles from thrift stores. Antique furniture overall is a major market in the world of thrift store flipping. Most sellers and thrift stores may not be able to assess the accurate values of the furniture that they accept and offer. This create a major sales opportunity for frugal thrift store buyers with a good eye and skillset for buying and selling items for profit. It is true that newer consoles – such as PlayStation 4 or Xbox One – have good resell values. The chances of finding one of those new-generation consoles in a thrift store are slim to none. Even if you did find one, the purchase price would adversely affect your profit margin. The best way to make the most money off video game consoles is to focus on classic consoles – such as Atari, NES and Sega Genesis. Classic video game consoles are often sold at thrift stores for a fraction of their worth. You can also look for newer systems on Craigslist and websites that advertise local listings. Most of these listed items are sold for considerably low prices by sellers desperate to get rid of it., making them the best things to buy and sell for profit. You may not get very much money for reselling game discs – especially when you consider the growing number of competitors selling the same products. However, you should search for video game cartridges to have a better chance of making a profit. Some of the easiest things to flip for profit are popular video game cartridges from Atari, Nintendo, Super Nintendo, Sega Genesis and even Nintendo 64 systems. Test for functionality to ensure that your product listings are as accurate as possible. If you are not sure of the functionality, make sure that you advertise it “as-is” to ensure customer satisfaction when you flip it. Depending on the age of the cartridge, it is understandable if it may not play or function as well as it did when it was first manufactured. You just need to have all the facts available before you try to flip it for profit. Maternity clothing will always be an in-demand market. This should not surprise thrift store shoppers – especially with the increasing number of pregnant women and newborn babies around the world each year. Expectant mothers will typically search for used maternity clothing before paying full retail prices for new clothing. This means you can make a solid profit by flipping maternity tops and pants. Pay close attention to the elasticity and overall condition of the clothing. If it is too worn out, then its overall resale value will suffer. If you want to make a decent profit with thrift store flipping, you should never overlook quilts and handmade blankets. There is a high demand for quality blankets and quilts that is overlooked by many consumers and sellers. Check the condition, color and overall stitching quality before investing any time or money. You should also spend a little time and money on making sure they are cleaned thoroughly without damaging the quality, condition or appearance. In addition to quilts and blankets, you can also find out that some of the easiest things to flip for profit are also vintage rugs and runners. For the homeowners \ who enjoy the vintage and antique décor vs modern/contemporary, you can grab their attention (and checkbooks) by searching for these quality floor furnishings. You do not see light-up ceramic holiday decorations and ornaments in stores very often. This is primarily because of the less-fragile alternatives that have essentially replaced them in recent years. To appeal to the customers who like the old-fashioned beauty and aesthetic appeal of ceramic decorations, these can be huge sellers for you. These desk lamps look vintage and can easily attract the attention of consumers interested in vintage/antique products. They are not typically sold in department stores anymore as new products due to the diverse collection of new designs and concepts. However, if you manage to find one in a thrift store, you should consider cleaning it up, replacing the bulb and flipping it for profit. Brand name clothing is very popular – depending on the specific brands that you find. Do a little research to determine which brands generate the most buzz and make sure that you keep them at the top of your list. Most thrift store shoppers interested in finding the best things to buy and sell for profit follow the basic rule of thumb to search for anything with a tag. Whether you sell these items online or offline, advertising the clothing as “new with tags” will more than likely draw a big crowd of potential buyers. If you have sports memorabilia, then you have some of the easiest things to flip for profit. Many people eager to find ways to make money know that there is a major market for various types of sports memorabilia. From game balls and jerseys to autographed photos and even marketing material, you may be surprised by the money you make. Make sure that you search for rarity or popularity. The most popular athletes do not always generate the most valuable memorabilia depending on availability and prevalence. Take the time to do a little research to make sure your money is going into the right things before you dive into thrift store flipping.